At this point in cyber security, mostly everyone knows what threat intelligence is, but how do you actually apply it? Many think feeds are the be all and end all for security teams. Feeds can be helpful, but in many cases they're binary and, while useful for comparison with internal security data, they might not give you the context you really crave. 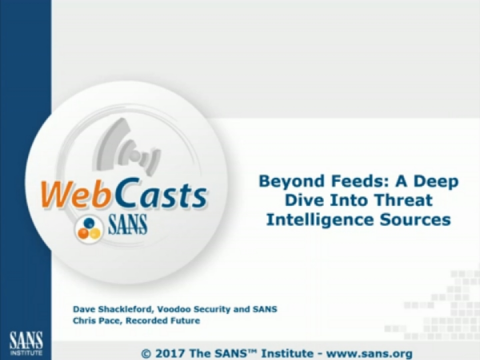 - Go beyond feeds and look at specific technical, open, and dark web sources that, when combined, can open you to the multifaceted world of available threat intelligence. Dave Shackleford is the owner and principal consultant of Voodoo Security and a SANS analyst, senior instructor, and course author. He has consulted with hundreds of organizations in the areas of security, regulatory compliance, and network architecture and engineering, and is a VMware vExpert with extensive experience designing and configuring secure virtualized infrastructures. He has previously worked as CSO for Configuresoft, CTO for the Center for Internet Security, and as a security architect, analyst, and manager for several Fortune 500 companies. Dave is the author of the Sybex book Virtualization Security. Chris works for Recorded Future to engage and educate audiences on the power of real-time threat intelligence, using his extensive experience delivering security solutions to all kinds of organizations. Before beginning a career in information security, Chris trained as a Broadcast Journalist and also has worked in IT departments in the public and private sectors.